Amazake – a slightly sweet beverage made with rice – is one of the most well-known of fermented food products enjoyed by Japanese. 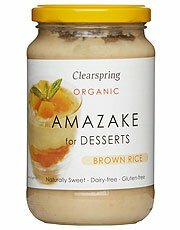 Originally consumed as a way to ward off fatigue in the dog days of summer, amazake is now available year-round in supermarkets. This is a simple recipe for how to use kome kōji to make amazake in a rice cooker. Amazake can also be made with lees (rice residue) from the brewing of sake, which is known in Japanese as “sake kasu.” This recipe, however, doesn’t use sake kasu, so the amazake that results will have no alcohol and can be enjoyed by adults who do not consume alcohol, and by children as well. The nutritional content of this amazake is similar to that used in IV drips administered for dehydration and, during the Edo period of Japan’s history, was consumed as a way to overcome the physical stress of hot summer days. 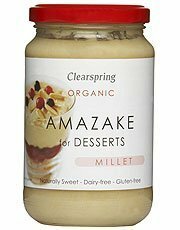 Amazake is sweet and can be used to impart a delicate sweetness to dishes calling for a bit of sugar. 1. Wash the mochi rice in plain water and soak for at least 1 hour. Transfer the rice to a rice cooker together with water (A) and cook it. 2. Once the rice is done cooking, add water (B) and lower the temperature of the mixture to 60℃ to 70℃ (140℉ to 158℉), which will allow the kome koji to become active. 3. Break up any lumps in the kome kōji, add it to the rice, and mix well. 4. Leave the lid of the rice cooker open and set the cooker to “warm” (In Japanese, this is written “保温” and pronounced “ho-on” with long Os in both cases.) Cover the rice / kome kōji mixture with a clean towel. Stir occasionally and your amazake will be done in 6 to 8 hours. Tips: Check the temperature of the mixture occasionally to keep it between 55℃ and 65℃ (131℉ and 149℉). If necessary, set the cooker to “cook rice” (In Japanese, this is written “炊飯” and pronounced “suihan.”). Once the mixture warms up, set the cooker back to “warm” (“保温”). If the mixture exceeds 65℃, turn the cooker off long enough to let it cool to the proper temperature range. Rice cookers can be turned off by pressing the “切” (pronounced “kiru”) or “取消” (pronounced “torikeshi”) button. 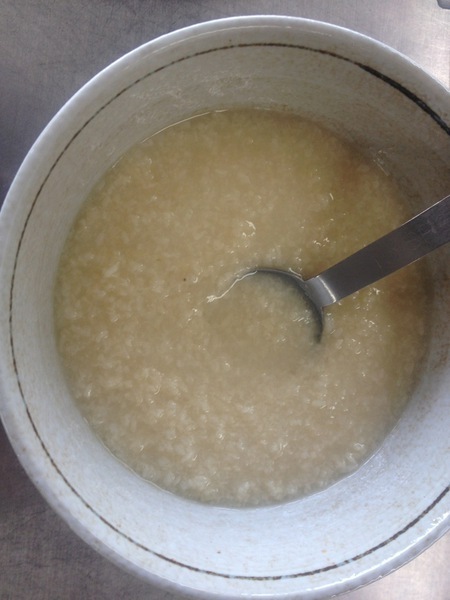 If you do not have a rice cooker and will cook the rice in a regular pot, you can still make amazake. The key point is to make sure the mixture of rice and kome koji stays in the proper temperature range, so the kome koji will be warm enough to be active and not so hot that it will die. Once your amazake is done, keep it in the refrigerator. It should be good for about a week. 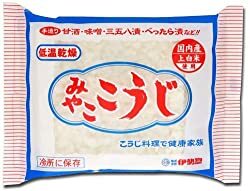 Amazake can be frozen, if you want to keep it longer. Dilute amazake with water (hot or cold) to enjoy as a beverage.